It is the result of the preparatory work initiated in Barcelona in 1998 in the framework of the Conference “Cities for Human Rights”, which was organised to commemorate the 50 Anniversary of the Universal Declaration of Human Rights. Hundreds of Mayors participated in the event and united their voice to call for a stronger political acknowledgement as key actors in safeguarding human rights. Participating cities adopted the “Barcelona Engagement”, consisting of a roadmap to draft a political document aimed at fostering the respect, protection and fulfilment of human rights at local level. During the two proceeding years, the European Charter for the Safeguarding of Human Rights in the City was drafted as the result of a plural dialogue between European cities, civil society representatives and human rights experts. The draft was discussed and finally adopted in Saint-Denis in 2000. 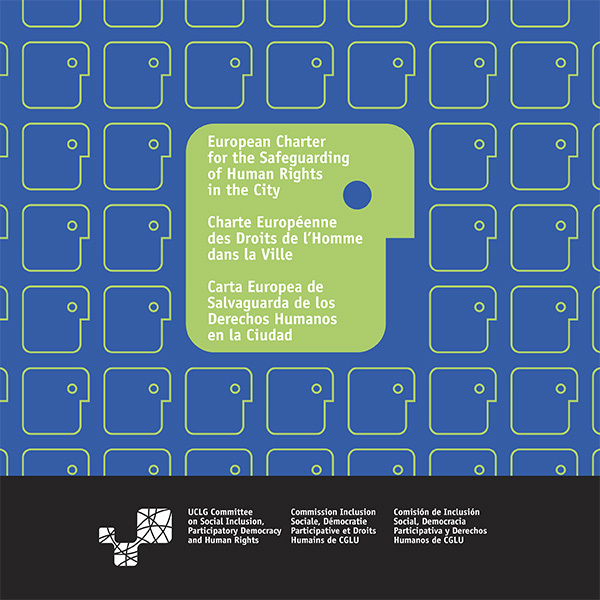 After the conference in Geneva (2008), the most active cities in the network (Barcelona, Saint-Denis/Plaine Commune, Lyon, Geneva and Nantes) decided to entrust the promotion of the European Charter for the Safeguarding of Human Rights in the City to the world organization of cities, United Cities and Local Governments (UCLG), through its Committee on Social Inclusion, Participatory Democracy and Human Rights. The Committee, initially under the political leadership of the Provincial Council of Barcelona (Spain) and subsequently the city of Nantes (France), was working since 2006 on the production of a municipal charter of human rights with a worldwide scope, the Global Charter-Agenda for Human Rights in the City. UCLG formally adopted this charter in 2011 at its World Council in Florence, which was attended by over 400 mayors from all over the world. The main differences between the Charter-Agenda and the European Charter lie, on the one hand, in the different geographic scope of each document (one is global, while the other is European) and, on the other hand, in the agenda or local action plan that the Charter-Agenda contains. As a result, in the Global Charter-Agenda for Human Rights in the City each right is accompanied by an action plan that is a benchmark for use by local governments when taking concrete steps for human rights implementation.